During a recent visit to Pittsburgh I was able to spend more time with the Ancient Order of Hibernians archive at the Heinz History Center. In an earlier post I reported there was a critical gap in the Division 15 (Hazelwood) meeting minutes from 1925 to 1935. I believe I’ve found the missing record. A separate box from the Division 15 records contains “unknown meeting minutes from 1924 to 1935.” These “unknown” minutes begin at Nov. 23, 1924. One book of the Division 15 minutes ends at Oct. 26, 1924. The “unknown” minutes end before another Division 15 book begins. The “unknown” minutes contain numerous references to Manus Gallagher, a division officer holder mentioned frequently in the Division 15 records. Gallagher helped my grandfather obtain U.S. citizenship. 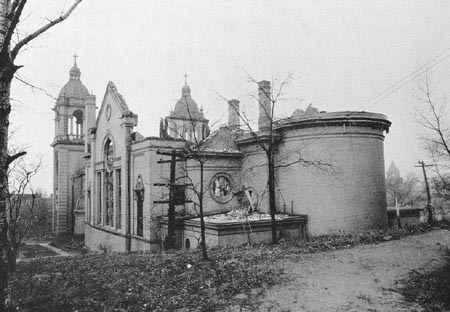 St. Stephen’s Church in Hazelwood after the November 1924 fire. The “unknown minutes” also contain numerous references to St. Stephen’s and Father Daniel J. Devlin, parish priest of the Hazelwood church from the late 19th century until his death in 1935. The Dec. 28, 1924, entry makes reference to the November 1924 church fire at St. Stephen’s and the AOH division agreeing to donate $500 for the rebuilding fund in $100 installments. Father Devlin’s thank you note to the division is mentioned in the next passage. I did not find any references to my grandfather’s February 1935 streetcar accident. I had thought the division might vote to offer some financial support, as it often did with other sick or injured members. The minutes also did not make any reference to the 1928 candidacy of Al Smith, the nation’s first Irish-Catholic presidential nominee. I notified the History Center staff about my belief that the “unknown” minutes belong with the rest of the Division 15 records. I hope they will adjust their finding aid. This entry was posted in Irish America and tagged AOH on June 12, 2014 by admin. Mark, I wonder what the cause of the fire at St. Stephen’s was? I know 1924 was a late date for anti-Irish Catholic sentiment, but it did and still exists today, in some circles we are still hated despite all we have done for this country. Also, that does seem odd that AOH did nothing for your grandfather’s family, I’m not an AOH member, but my grandfather was, but from what I understand, that is something that is normally done when a member dies unexpectedly like your grandfather, especially with a young family. As always, your blog is an interesting read. Don, I’ve never seen reporting, in 1924 or later, to indicate the case of the St. Stephen’s fire, much less that was an act of anti-Catholic arson. The church was erected in 1902, and no doubt there was a lot of wood in the place. I’d bet on a bad electric switch, which still would have been fairly new technology at that point.